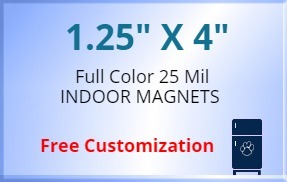 1.25 x 4 custom magnets 25 mil square corners full color magnet is being hugely favored by advertisers for indoor promotions because it offers them high ROI. 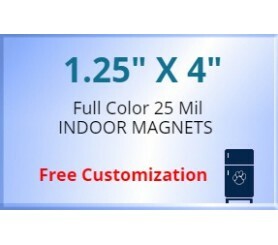 This magnet can easily highlight the business information imprinted against it and its 25 mil thickness means it can remain affixed over its surface for long time. Advertisers can choose to get it customized with regular business information or specific business information regarding savings or greetings or thanking favors. Customized promotional 1.25 x 4 square corner full color magnets can be favored for brand building/ goodwill creation during community, social, business and family events.